Sharp tools are critical to good work, as all turners know. If the tool is blunt, the wood rejects the cutting edge. If you force it to cut, it tears the grain. But sharpening bowl gouges and spindle gouges can be a challenge. It’s perfectly possible to sharpen them freehand, with or without the help of a platform set at the correct angle, but this is a skill that takes time to learn. Most people prefer sharpening gouges with a jig. 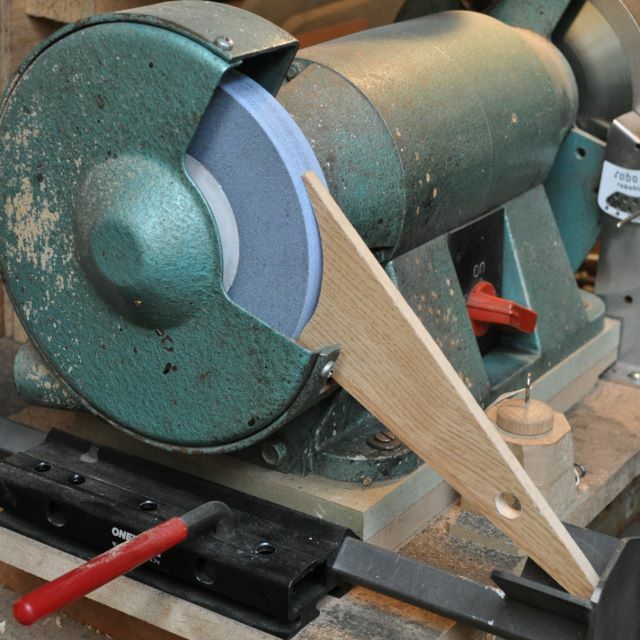 I use a Oneway Varigrind jig, the type to which this article refers. There are other jigs on the market, some designed to work with a grinding wheel, which I prefer, and others with a belt sander. There are plans online for making them. They all work in a similar way – they hold the tool to the grinder at a set angle while you shape the edge. Although it makes sure the angle is consistent, the jig doesn’t guarantee the shape of the cutting edge. You control that yourself, by grinding a bit more here or a bit less there. Once set up, jigs are quick and easy to use, and can give a consistent and accurate grind, removing the minimum of metal and producing a clean bevel. But how do you set them up? The key is to use setting templates. Up to three might be needed for each grind, but they can be made very easily, and some can work with more than one grind. None of the jig settings are critical, as slight variations will make little difference to the sharpened gouge. But the more consistently the jig is set, the less grinding will be needed, so the tools will last longer. If you have a properly ground gouge to start with, you can make templates to reproduce that grind. It will then be easy to reset the jig at any time, so you can either sharpen the original gouge, or duplicate its grind on another one. The first step is to set the jig to match the gouge. Use a marker pen to blacken the bevel on the gouge (this is only needed when setting up the first time). Put the gouge in the jig with the correct length projecting, following the jig manufacturer’s recommendation. Two inches is about right. Set the angle of the jig to about the middle of its range, and put the jig in place in the pivot cradle on the extending arm, tilted over as if to grind the wing of the gouge. Adjust the arm until the wheel best contacts the wing bevel, then lock it. This can be seen from the bright streak where the ink is removed when you turn the wheel by hand. It won’t contact perfectly unless the wheel is the same diameter as that originally used. Put the jig in its central position, so the gouge flute is facing up, and adjust the jig angle until the bevel at the nose of the gouge is in best contact with the wheel, and lock it. Now go back to the tilted position, and adjust the arm again as necessary. A couple of repetitions to set the wing, then the nose, then the wing and finally the nose again, will home in on the correct jig settings for that gouge. Remove the gouge from the jig, and make templates (see below) to fit the jig angle and the arm position that you have established. Label them. Then you can quickly go back to these settings at any time. If you want to change the grind of a gouge, you have to adjust the jig and grind the gouge until the required angles and shape are achieved. Then make the setting templates. If you know the angles you want, a machinist’s protractor will help get the settings right. The variables on the gouge are the bevel sharpening angle; the sweep angle of the wings (the angle at which they are ground back from the nose); and the profile of the cutting edge. A fingernail profile with a 55 degree sweep and 50 degree nose bevel angle would be good for a bowl gouge. Other angles can be used according to preference or for particular purposes. It’s a good idea to have bowl gouges with different grinds. If you are extensively reshaping a gouge, rough out the new grind on an angled platform before starting with the jig. For example, if you want to make a ‘40-40’ grind, start by grinding the 40 degree nose bevel square across without rolling the gouge. Then turn the gouge flute-down on the platform and grind the 40 degree sweep of the wings. The curve of the wheel rim will make the top of the wings concave, so lift the handle slightly when grinding the nose and push forward slightly when grinding the wing ends to make their tops flat. In this somewhat brutal process, you will grind the old cutting edge completely away, but you will clearly see the shape of the finished grind. The bevel angle to be ground on the wings is hard to judge without an example to copy. (Perhaps someone can suggest a method?) It’s less than that on the nose, because the inner sides of the flute curve upwards, and the included angle differs at each point along the wing. The included angle should not be too acute as that will make the edge weak and grabby in use. If you don’t have an example to guide you, put the gouge on the 40 degree platform. Swing it to the side and roll it until the wing is parallel to the platform. Then grind a bevel. You will then have a part ground gouge with a correct nose angle. It will have a provisional side bevel that you can use to set the jig as above. When actually sharpening gouges with a jig, or completing a new grind, set the tool in the jig using the templates. Grind the wing on one side, then the other, taking care to keep their tops level and at the required sweep angle. Don’t let the weight of a long gouge and handle push the jig forward in the cradle. Tools with detachable handles are easier to grind. Roll the jig from just off centre over to one side, without pressure, letting the weight of the gouge do the work. Do the other side, then lightly grind the nose, blending it into the wings to form a smooth curve. Too much pressure, or dwelling too long in one spot, will quickly spoil the shape. Take care not to make the nose pointed or square-tipped. Keep it level with the wings, not peaked or dropped. If reshaping the gouge, the flat top that you made earlier will guide you. But before completing the grind, assess the wing bevel angle. Adjust the jig according to your judgement. The wings should be straight in profile, or slightly convex, not concave. It can help, particularly when grinding the nose, to switch off the grinder and use its momentum to work as it slows down. This makes the grinder less aggressive. A perfect grind is rarely essential, so if there are minor errors, it’s usually possible to do some turning with the gouge before correcting them during the next sharpening. After a bit of practice the sharpening becomes quick and easy. The first is a template to set the jig locking angle. Its design will depend on the grinding jig. Identify two reference points on the jig and make a template to position those points. For the Varigrind, I use two scraps of ply glued together in a wide, flat V. One arm rests against the face from which the gouge protrudes. The other rests against the side of the pivot arm). The second is a template to set the gouge projection. At its simplest this can be a stop block the right distance from the edge of the bench. I drilled a blind hole of the right depth in a scrap of wood and fixed it to the bench. A coin in the bottom of the hole stops the gouge nose digging in. I stand the jig on top, face down, and insert the gouge so it is standing free in the hole, then tighten the jig clamp. It’s not normally necessary to change the projection, so this template will serve for most gouges. The third is a template to set the distance of the jig cradle from the wheel. It’s best to reference from the wheel itself, to allow for wear. A dowel of the right length between the cradle and the wheel rim would work, but would not be as positive as a spacer with two-point contact. I use a narrow triangular scrap of board. I cut it too long, then put it in position, but alongside the wheel. The position of the wheel rim can then be marked on it with a pencil and the curve cut with the band saw. Cut enough clearance in the middle so it contacts the wheel at two points. Next post: Dust control at the lathe. What works best? Hmm, whilst it is a very neat guide for sharpening gouges, there is an issue with resting plywood against a grinding wheel. The risk is that the resin in the adhesive will melt into the surface of the wheel and expand as it gets hot, forcing the structure of the wheel apart which will potentially result in bits flying off at high speed (the surface speed of a grinding wheel can be 200mph). Ideally the jig should be set clear of the wheel rather than resting on the wheel surface. Sorry to be boring but safety is paramount. Mike, I have no problem with you raising safety concerns. But the wheel is stationary when the template is in contact, so it doesn’t get hot. The templates show little sign of wear after years of use, so can’t be losing much material to the stone, which gets dressed often to clean it.